Let a foodie guide lead you through the streets of downtown Denver on a food and cocktail tour. 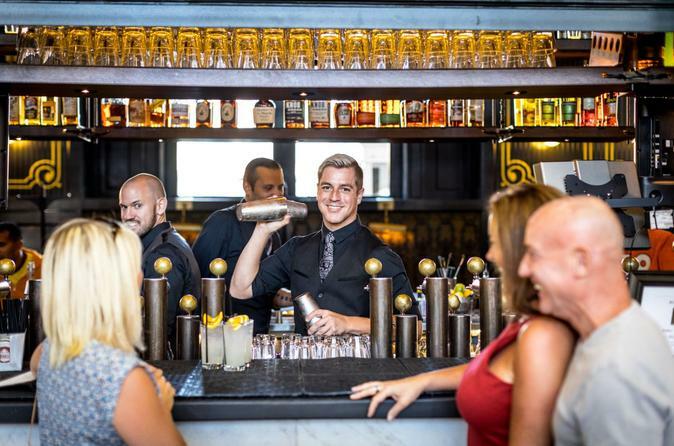 This 2 1/2 hour walking tour includes four stops with cocktail tastings from some of the best mixologists in Denver along with some tasty bites. Besides drinking some of the best cocktails in Denver, experience a hands-on cocktail demonstration from one of the best mixologists. The tour also includes a visit to one of the oldest bars and oldest brewery in Denver. You’ll learn about the spirits, the history, and the preparation of these delicious cocktails, as well as, some great stories of Denver. Numbers are limited to 10 guests to ensure a small-group experience. Meet your guide at a central location in Denver to start your 2.5-hour food and cocktail walking tour. Satisfy your craving for good food with each tasty bite while quenching your thirst for knowledge — and the best cocktails! You’ll stop by five tasting locations, including the oldest brewery in Denver, the legendary Champange Room Corrider 44, learn how to make a great cocktail with the Crimson Room, and other great eateries and food stands chosen by your guide to highlight local cuisine and drinks. Sip a vodka cocktail made with fresh lime and cucumber paired with regional cheeses, let a mixologist prepare a sangrita cocktail made with all-natural ingredients, indulge in a delicious crafted cocktail at one of Denver oldest lounges, enjoy beer tasting at Denver´s oldest brewery, and finish the tour with a hands-on cocktail demonstration of how to make the perfect Manhattan. Between tastings your informative guide will point out some of Denver’s must-see sights.